We all know from following Aubrey Miles’s Instagram account that she’s obsessed with her plants. In between posts of the actress and fitness buff planking, weight training, and even racing, you’ll find her in her indoor garden, fiddling with the philodendrons or checking out a new woven planter. In our old article about the actress’s budding green thumb, we saw Aubrey decorating a corner of her lovely home with a fiddle leaf fig tree. But upon checking her Instagram account, we were delighted find out that her home now looks like a veritable greenhouse these days. A traditional greenhouse is a structure for ornamental or edible plants that is made out of glass walls that allow the sun to shine on the plants, while protecting it from harsh weather. Aubrey created a greenhouse by locating most of her indoor plants by a wall of large windows. 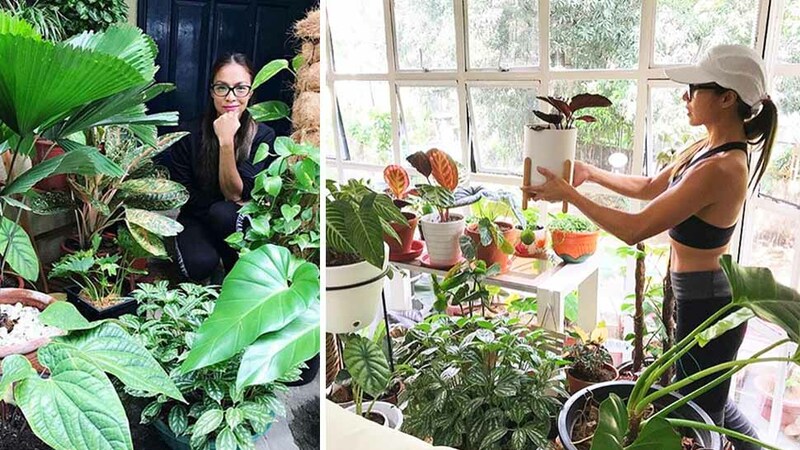 Aside from her favorite philodendron species and fiddle leaf figs, we spotted selloum, calathea, monstera rhapidophora, and a money tree amongst her potted treasures in what she calls her “urban jungle.” Some of the plant stores she purchases from are @tierraplants and @happyplantco. She also has a succulents corner, where she has euphorbia cacti, and a Mickey Mouse Ears cactus, among others. And because of all these plants, Aubrey is obsessed with pots and planters, and loves to match them with her plant babies. She had a gigantic basket customized by @candc.ph for her eight-foot-tall fiddle leaf fig tree, and ordered terracotta pots of different sizes. The actress says in an Instagram post, albeit jokingly: “I really don’t have a lot inside my house. You have to see the plants at my door front, hahaha.” We really think she has a lovely, lush home!